One of the best parts of Lancers is that even if life takes someone away for a few years, they can always find their way back “home” to Lancers. Mauresa Godbout, our featured adult rider, is a great example of this! Mauresa started riding in 2003 when she participated at the age of 10 in one of the Lancer beginner summer camps. It was driving past the outdoor arena when she was really young that first captured her attention. She would see the horses and ask her parents if she could ride them but her parents initially thought that Lancers only had police horses. Then one day they were driving down Bell road and she saw several horses being ridden by children her age and it reminded her of her favourite show, “The Saddle Club”. 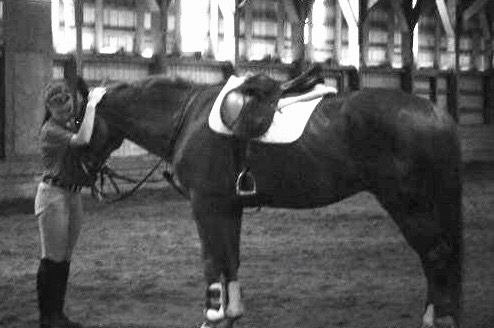 She begged her parents to enroll her in riding lessons and her mum eventually said that since it was an expensive sport, she could only join if she quit figure skating and swimming. So, she quickly did and chose riding! Her first favourite horse was Panda because she was very sweet and good with her as a beginner. She then loved Cash, Ceilidh, Willy, Norman, Punkin, Rocky, Victor, Joey and Bucky. Mauresa was then off to the races and got involved with the Junior Executive as a ride rep for her ride, did a lot of volunteering for the Saturday morning canteen as well as the Downtown Horse Show Canteen, helped with hay and shavings deliveries, sold cookie dough and chocolate bars for fundraisers, did barn clean up days, and participated in Halloween and Easter Fun Days where they would spend a Sunday doing treasure hunts throughout the barn and play games in the arena with the horses. She then became a Musical Ride “spare” and eventually got to fully join the Musical Ride. “It was an incredible experience”, she said. After Ride 1, Mauresa had to leave Lancers for a few years when she went to university. 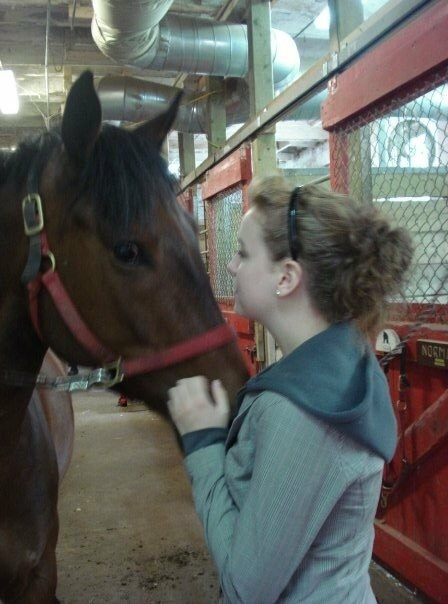 She got her horse fix by joining the SMU Equestrian Team but in her last year of university, she was able to come back to Lancers because she couldn’t wait any longer! She is now in our Thursday night J3 ride! According to Mauresa, her current favourite horses are “Oliver because he is a pleasure to ride since he’s so talented, and Sadie because she is fun to figure out and I feel such a sense of accomplishment when I am able to get her to go nicely”. When not riding, Mauresa has also tried out a few different hobbies in the past few years including aerial hoop, acrobatics, cosplay, and weightlifting. Riding has and always will be her number one passion. Mauresa now works as a Dental Assistant and recently has become a new dog mom to a Sheltie puppy that she wants to train in obedience and agility. In the future, Mauresa would love to lease a horse at Lancers to have the experience of riding the same horse for a year and really getting to know them and further her skills. She certainly plans to keep riding at Lancers for life and thinks that maybe someday she will muster up the courage to compete outside of the in-barn shows!